Recently, I’ve been feeling unmotivated on the weekends. I think a lot of it has to do with my terrible habit of going out on Friday nights. I know, it doesn’t sound like it’s that bad of a habit. Everyone needs to blow off a little steam after a long week at work or whatever. However, I tend to blow off a little too much steam. Which usually puts me behind schedule on Saturdays. Which usually makes me feel, I guess, disappointed in myself for not getting everything done that I said I would do, like write and shop for a dress to wear to this wedding I have coming up and drop off my dry cleaning and grocery shop and all of the other things I put off until the weekend. Anyway, this past Friday, I did not go out. I went to the gym instead. The thing about going to the gym on a Friday night is that it gives me this weird mixture of feelings like, “I’m so awesome because I’m so dedicated to working out that I’m here on a Friday night” but also “I’m so depressed because I’m not socializing”. I’m actually not at all dedicated to working out and I did go to happy hour with a co-worker before hitting the gym, so one might say that I had no right to have either of those feelings, but I had them nonetheless. After about ninety minutes of performing some variety of movement on several machines while reading The New Yorker and watching the combination of chubby teens, Polish dads in inappropriate gym clothes and intimidatingly sinewy tattooed women cycle through the cardio room, I hobbled out of the YMCA – again, I am not a very dedicated gym-goer – and to Grapepoint Wines, which is very convenient to where I live. I figured I would grab a bottle of wine and partake in some while reading some more and relaxing in my living room. Instead, I ordered a large-ish amount of sushi, watched Side Effects on demand with my roommate, drank more wine than I’d intended to and stayed up until 2 am. I felt…just OK the next day. Not as great as I wanted to feel. But I got up at a decent time because I had things to do and went to Cafe Grumpy where I thought I’d do some reading. However, I couldn’t find a seat that I liked, so I took my coffee to go and went to Baker’s Dozen on Manhattan Ave. to grab a bagel. I sat there for a little bit, reading a little of Lucky Jim but I mostly was just annoyed that they hadn’t toasted my bagel as much as I would have liked. After that, I walked to the Bedford L stop and hopped on the train to Manhattan to go shopping. I’ve known that I needed to buy a dress for a wedding I’m attending on June 29th for over a year at this point. Obviously, I just got around to it on Saturday. I went to the Anthropologie on 5th Ave. (and 16th St.) because I’d stopped there last week and saw a few things that were (surprisingly) reasonably priced and wedding-appropriate. There was one dress in particular that I saw and loved, but after walking through the store about five times, I couldn’t find it and assumed that it had sold out. Eventually, I grabbed a bunch of other dresses and hit the dressing rooms. While I was in line, I noticed a rack of dresses that were all priced at $89.95 for a limited time. And my dress was there! In my size! It was the first thing I tried on and it fit like a glove so, I bought it. After my dress success, I headed over to Chelsea to have lunch with a friend at the new-ish Meatball Shop on Ninth Ave. I was still kind of full from my bagel but…I managed to eat veggie balls over a salad and was content with that. (That meal sounds lame but it was actually really good.) We hung out for a bit outdoors after lunch and then I walked to The Strand, mostly because I hadn’t been in a while but also because I wanted to find something for my dad for Father’s Day. 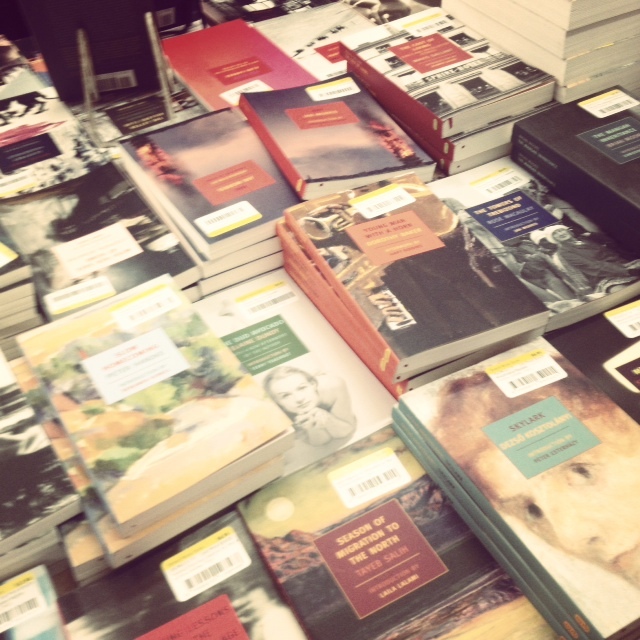 While there, I was very tempted by a whole table of NYRB Classics, but I ended up buying the first volume of A Dance to the Music of Time for myself and a book of Greil Marcus’s writing on Bob Dylan for my Dad. I took the L back to Brooklyn and walked home, stopping at the Van Leeuwen Ice Cream store on Manhattan Ave, which has unfortunately become a regular thing for me now that the weather is nice. Once at my apartment, I had a few hours to kill so I watched some of Orphan Black, a show that aired on BBC America this spring. I just heard about it a few weeks ago and am about halfway through the ten episodes, which I guess means that I’ve been digging it so far. Later in the evening, I met my friend Mandy at Europa, a night club on Meserole Ave that I literally did not know existed until recently. 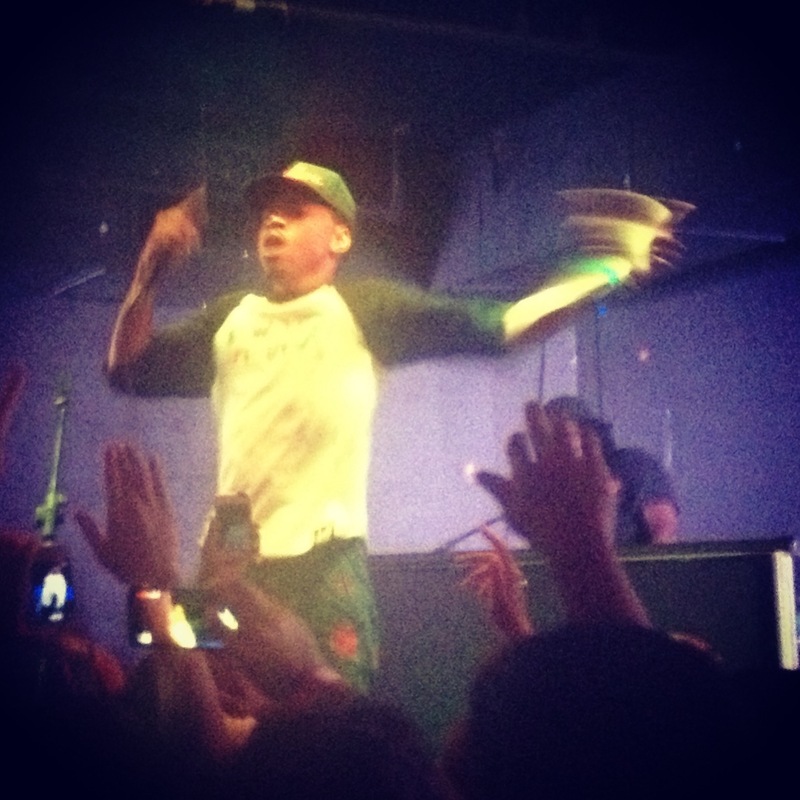 We were there to see Chance the Rapper. (Download his mixtape, Acid Rap, here.) I would say that, at 25 years old, we were in the upper quartile in terms of age in the crowd. But we had a pretty good time anyway. After the show, which ended quite early, we headed to a nearby cocktail bar, where Mandy and I had a long overdue catch up session and also where, before leaving, I very casually (not casually at all) left my number for one of the bartenders on a napkin, because that’s something I do now. It hasn’t worked yet, so um, let’s see how long I can keep this up. The next morning, I got myself ready and headed up to Bronxville to celebrate Father’s Day with my family. My grandmother and aunt and cousin were coming for dinner but I got there early to help my mom make dessert. 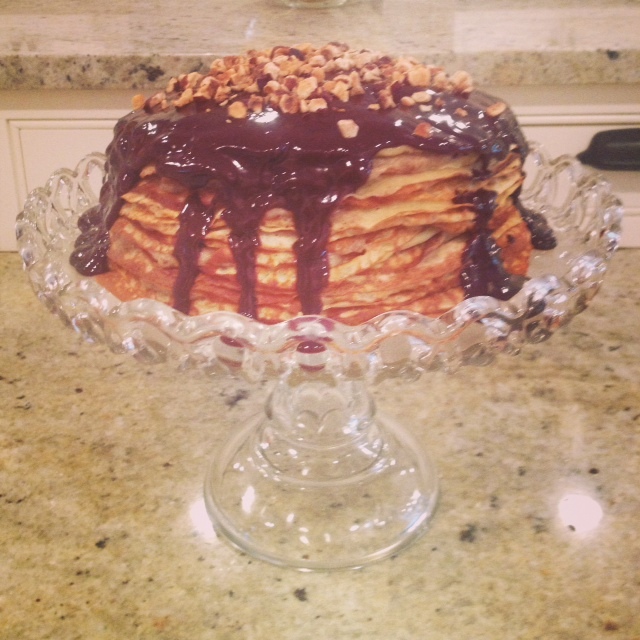 We had decided earlier that week to make Chocolate Hazelnut Crepe Cake from The Smitten Kitchen Cookbook, which I just got my mom for her birthday. 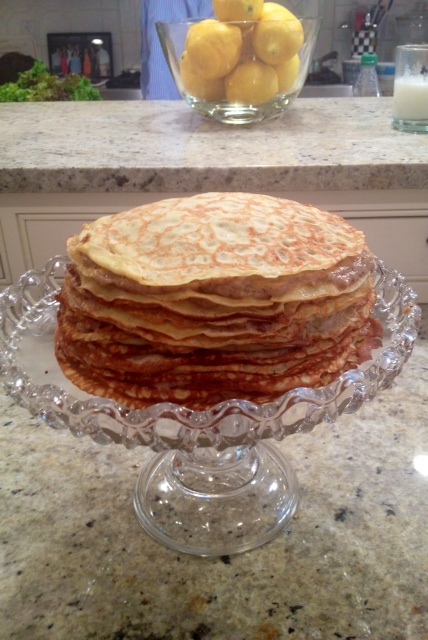 By the time I got home, my mom had already mixed up the batter for the crepes and had gotten started on the hazelnut pastry cream, but I took over from there. 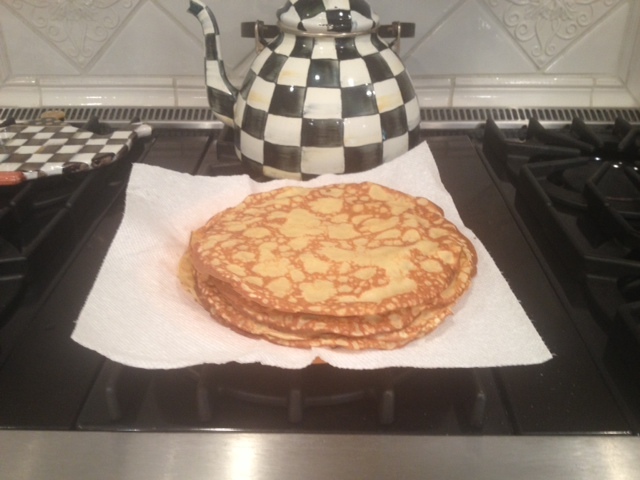 The crepes were a lot easier to make than I had assumed. 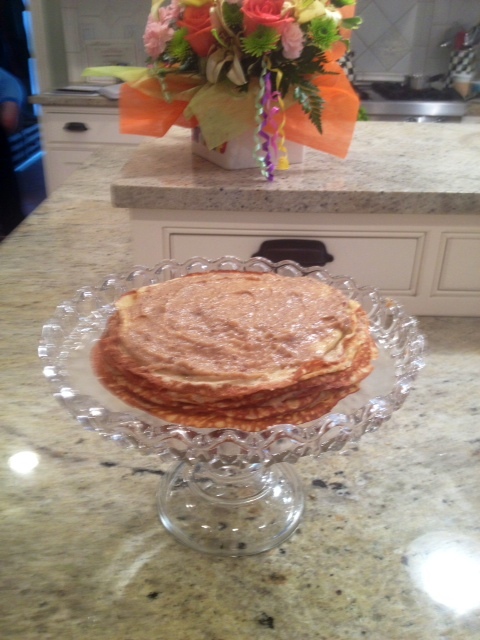 (It was my first time making crepes!) Once the pastry cream had sufficiently cooled, I assembled the cake on a cake stand, layering the crepes and pastry cream. After I had finished that, I made the chocolate topping from some semi-sweet chocolate chips, heavy cream and Frangelico. The final product promised to be delicious. It was…okay. And that was because we didn’t refrigerate the cake, which we totally should have, but there wasn’t really any room in the fridge. The cake tasted really good, it just didn’t set up very well. But…now we know for the next time. 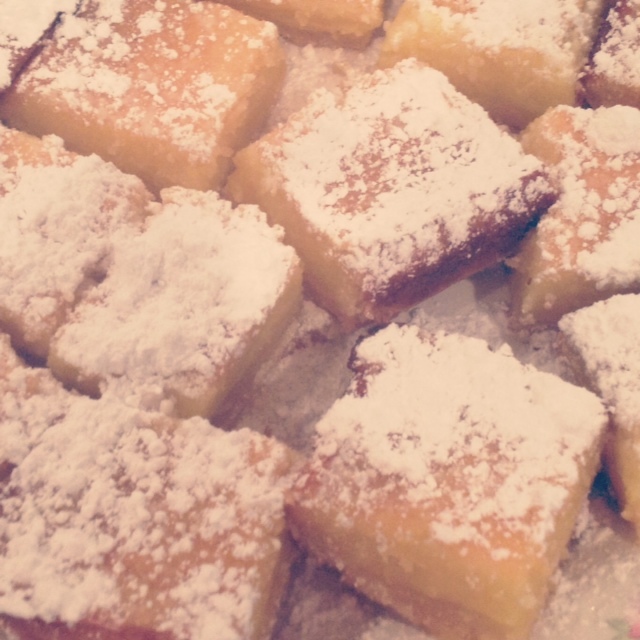 My mom also made Lemon Bars from the same cookbook and they turned out really well! The whole day was really nice. After our guests left, I read outside while it was still light out and then I put on some pajamas and read in my favorite place to read, in the living room in the biggest, comfiest chair. And then I watched Mad Men. And then I went to bed. So, I woke up yesterday feeling tired but quite accomplished. I did a bunch of things and I had fun doing them and that’s good, I suppose. Of course, I still feel like I should have gotten some writing done or purchased shoes or accessories to wear to this wedding or like, a million other things, but…I still have time. Which will be true for a while, you know, until I don’t have anymore time. Yet I will keep telling myself that I still have time. Because if I don’t, I’ll spiral into an existential crisis, which is usually really bad for my mood and most of all, my motivation.